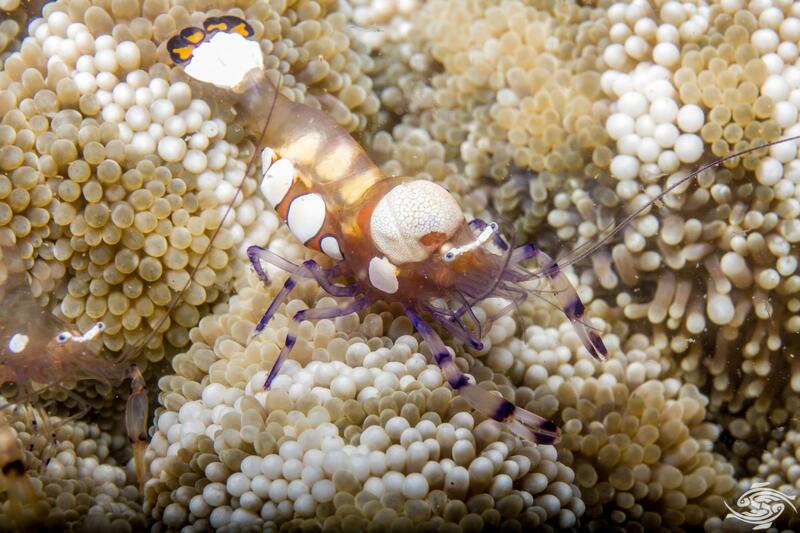 The Pacific Clown Anemone Shrimp (Periclimenes brevicarpalis) is also known as the Peacock-tail Anemone Shrimp, White-spot Anemone Shrimp, Five-spot Anemone Shrimp, Glass Anemone Shrimp, Snow Capped Anemone Shrimp and the Pontoniine Shrimp. As can be seen they have a large number of regional names. 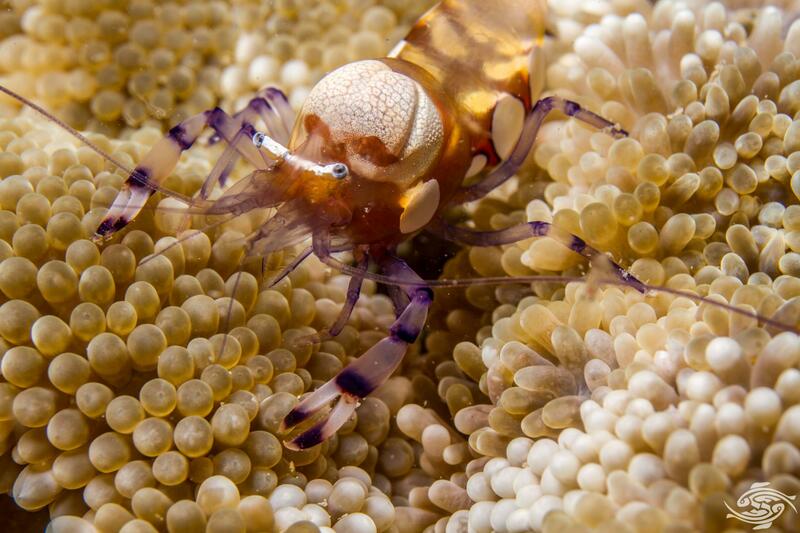 The Pacific Clown Anemone Shrimp has a maximum body length of 40 millimetres and is a very attractive looking shrimp. The base colour is transparent and on the females the side of the abdomen is tinted orange with large white dots. There is also a prominent white hump just behind the eyes on the female. Under magnification this hump is covered in a floral pattern. This can be seen in the images below. The purpose of the hump is not known but it is likely that it attractive to the males. The head is tinted orange and there is a white line between the eyes. 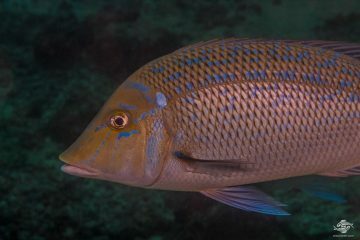 The males are not as colourful and do not have the dots on the side or the white hump.The tail is white on both sexes and there are five segments on the end of the tail with orange marks surrounded by purple. 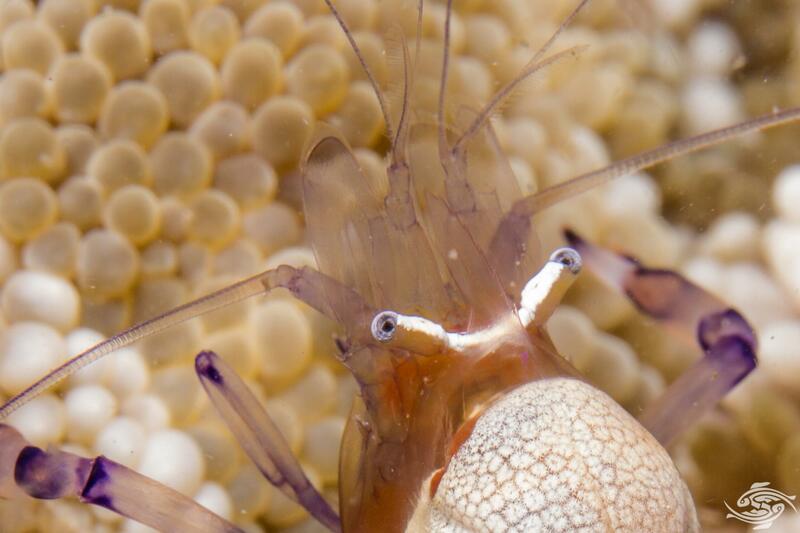 The eight legs are transparent with a purple tint and there are purple marks around the joints of the legs.Two long feelers and six smaller ones protrude from the front of the head and the front legs are banded in purple and have proportionaly large chelipids on them. 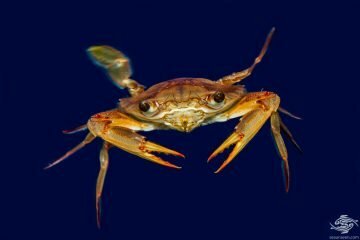 There is a serrated spike pointing forward between the eyes and two others on the side of the head. 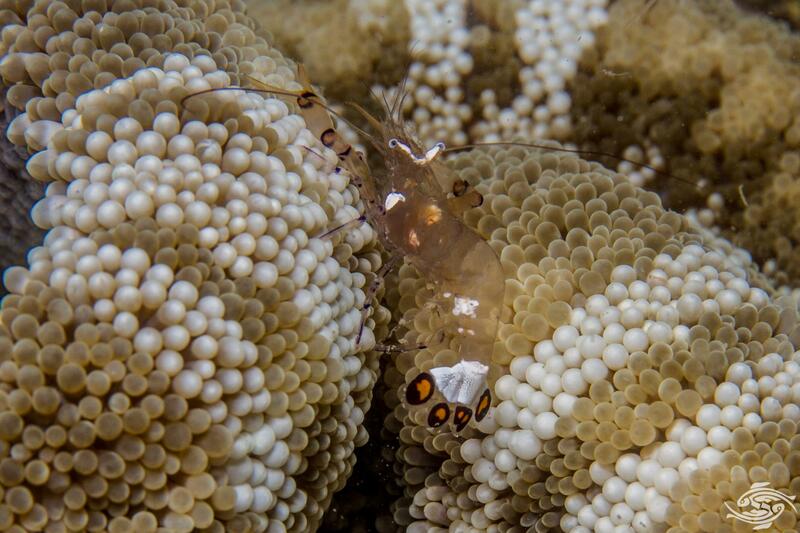 In Tanzania Pacific Clown Anemone Shrimp are almost always found on Haddon’s Carpet anemones (Stichodactyla haddoni) in Tanzania. 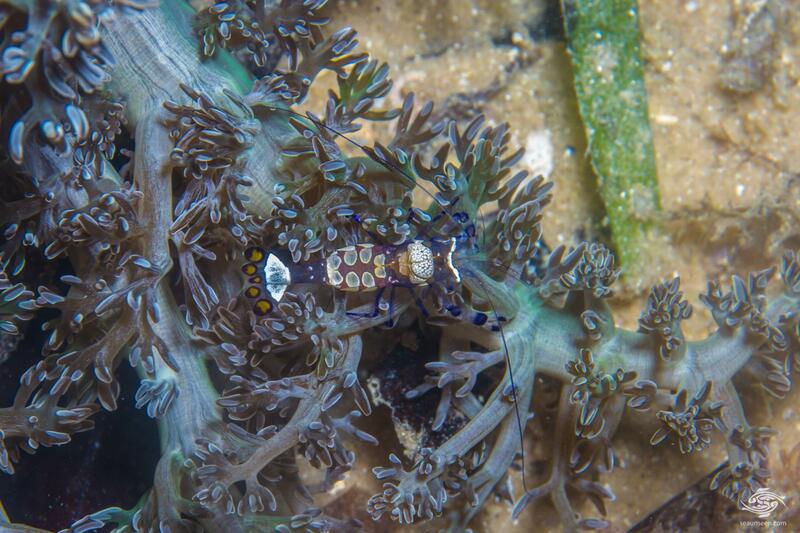 They are also seen on the Adhesive anemone (Cryptodendrum adhaesium). Occasionally we have seen pairs in a Magnificent Anemone (Heteractis magnificae) but this is unusual. 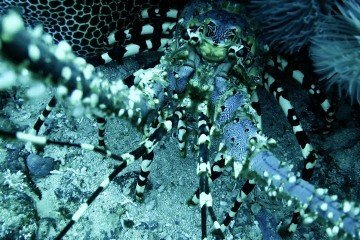 They are almost always found in pairs and will often hide under the folds of an anemone once they see a diver. Being semi transparent one often has to look hard to see them but once one knows what to look for they are easy to spot. Recently we have also found them on Actinodendron hansingorum, also known as the Branching anemone or Hell`s fire anemone as pictured below. 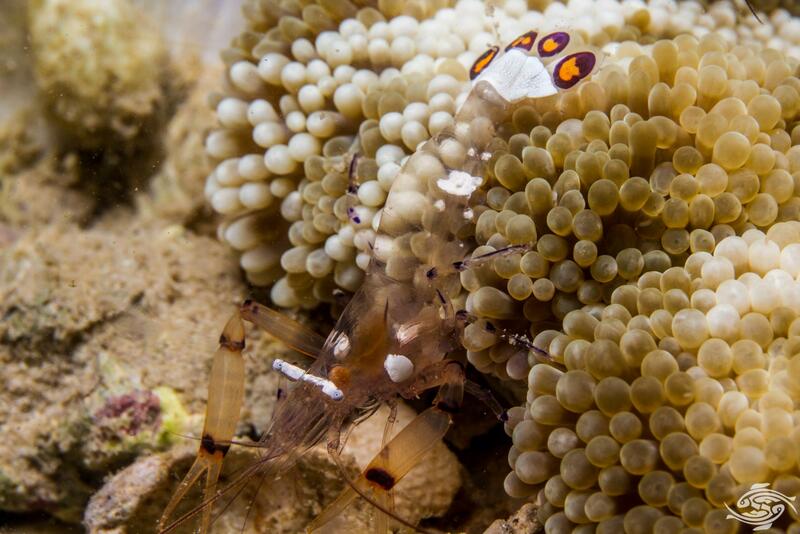 There is some debate as to whether they have a symbiotic relationship with the anemones they reside in or whether the relationship is parasitic. They have been observed clipping the host anemones tentacles off and eating them. This has led to some experts classifying the relationship as parasitic. 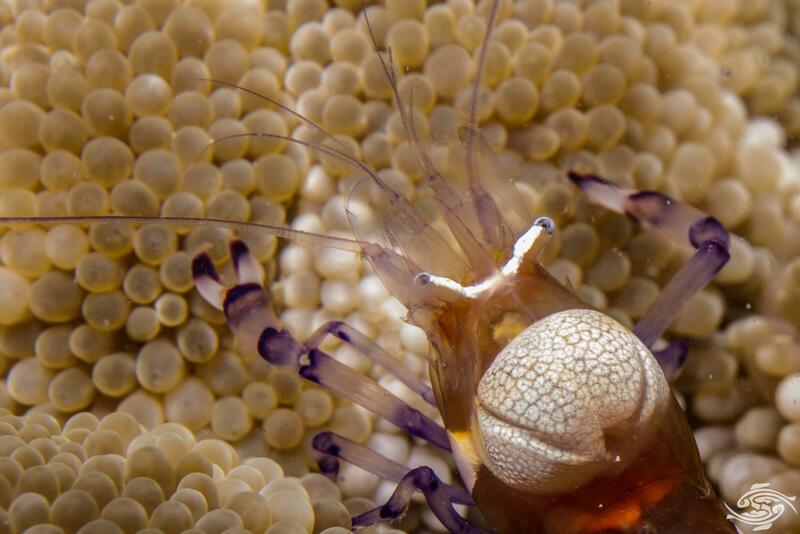 They almost certainly keep the anemone free of other parasites and it is likely that there is some benefit to the anemone. 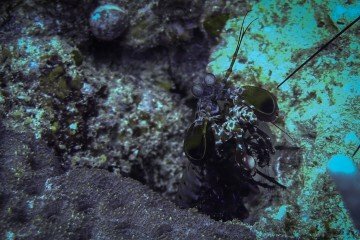 To prevent the anemone from eating them , they have evolved a specific behavior. They coat themselves with mucus from the anemone and once coated the anemone ignores them. As they change shells regularly this means that they have to recoat themselves on the shell change. 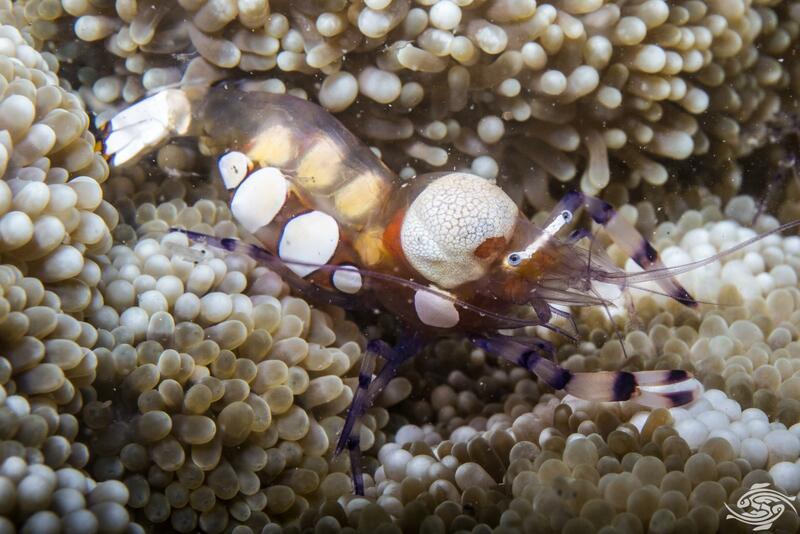 Although they are known as the Pacific Clown Anemone Shrimp, they are distributed across the Indo Pacific area. 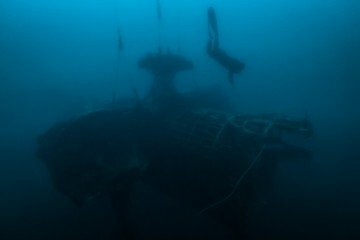 They are found up the East African coast across to Australia and New Zealand and up to Japan. They are found from depths of one meter to at least thirty meters on the Tanzanian coast. 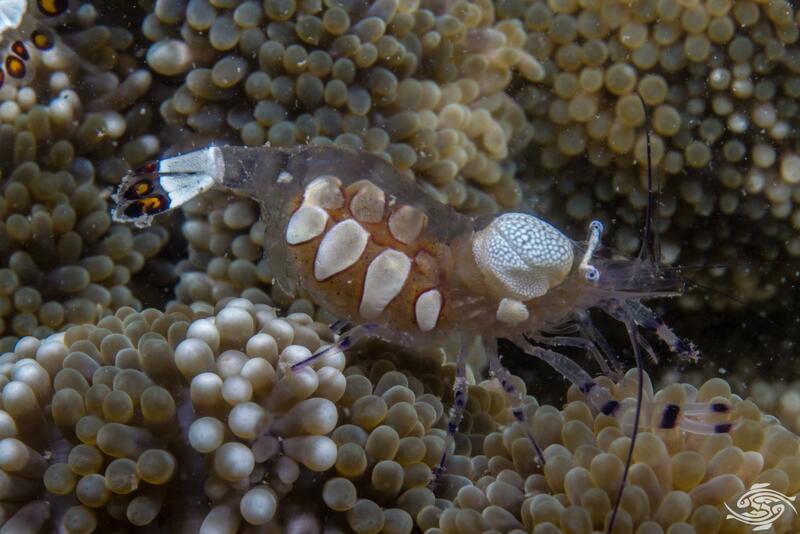 The Pacific Clown Anemone Shrimp feed on mucus and leftovers from the anemone, detritus and small benthic organisms. 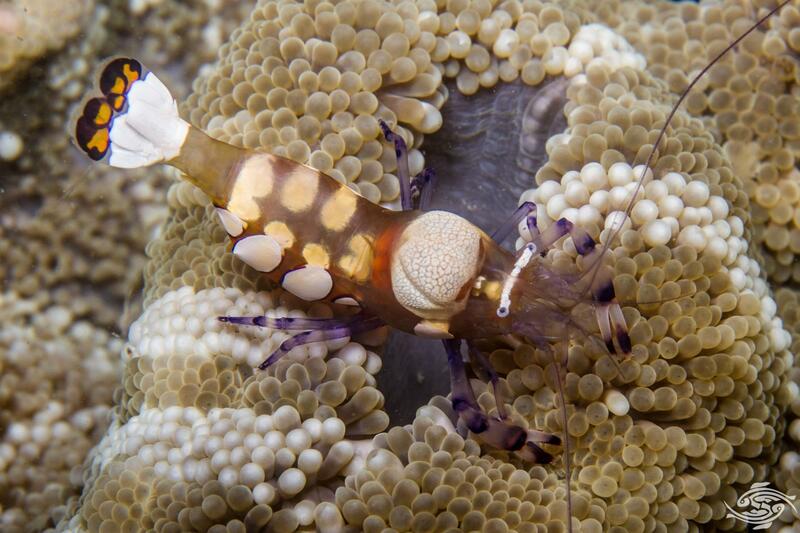 The Pacific Clown Anemone Shrimp are either maleor female and form monogamous relationships. They are almost always seen in pairs. Once they mate the eggs develop on the female and when these hatch there are several larval stages that the larvae go through. 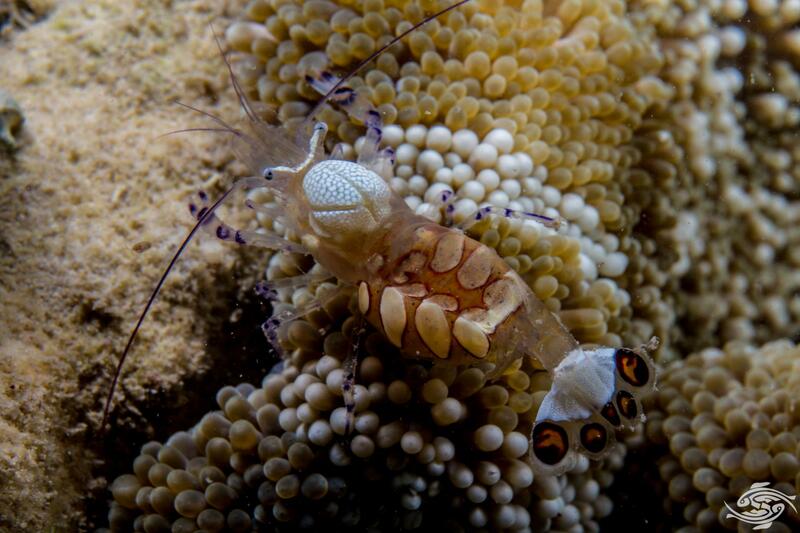 The orange colored eggs are kept on the underside of the female as can be seen in the image below. They are free swimming for a period until the young develop into small adults. The female can only mate at a certain stage of moulting. 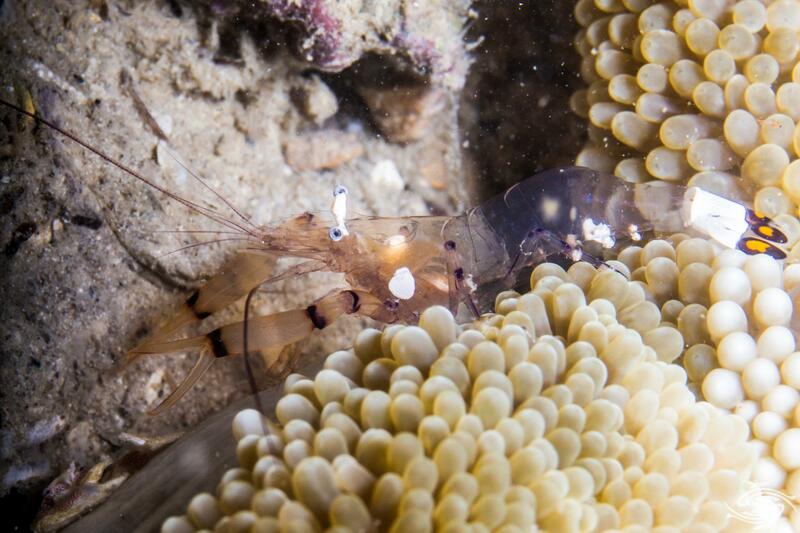 Pacific Clown Anemone Shrimp are collected for Marine aquariums and in some areas this collecting has substantially reduced the population. With their striking coloration they make an attractive addition to an aquarium. 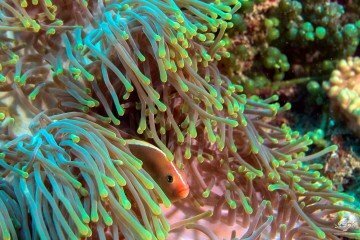 They are happiest when in an anemone and are easy to feed and care for and are considered reef safe.